Cirque du Soleil has just unveiled an Art Garden adjoining their international headquarters in Montreal. The garden features 16 major works of art from artists around the world. Andrew Rogers has a strong, continued presence with Cirque du Soleil with the large scale Rhythms of Life sculpture being the feature of the entry to the head office. Two of his large-scale sculptures are featured in the grounds of their international headquarters and the new Art Garden. Weightless 5, and Unfurling are on display for public viewing. The Art Garden was created to enable the local community to interact and enjoy the art pieces in a public setting. The Art Garden also features a vegetable garden and a labyrinth, built by Cirque du Soleil employees. 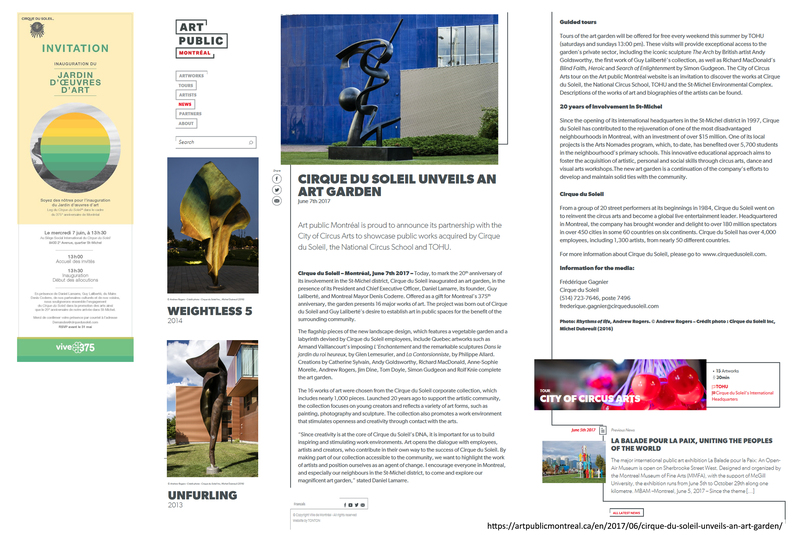 The Cirque du Soleil art collection and Art Garden provides an inspiring, creative and stimulating environment for employees and visitors through contact with the arts.